A. L. C. Cadot’s name is not in the Commonwealth War Graves Commission database, nor is he listed in the Soldiers Died in the Great War 1914-1919 database. 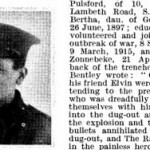 Although there was an Auguste Cadot listed in Streatham and an Adolphe Cadot in Lambeth, I could not be sure which one was on the war memorial and was inclined to accept that Cadot was likely to remain a mystery to us. Quite a few names on the memorial are difficult to trace, but this is usually because their names are so common and a connection with Lambeth or Wandsworth cannot be proved. Generally, the more unusual the name, the easier it is to identify the man. The National Archives hold a medal card for an Auguste Cadot (he was given the Victory Medal) as well as service and pension records. British Army service record shows that on 11 December 1915 Auguste Cadot, then living at 17 Tregothnan Road, Stockwell SW9, enlisted at Clapham. 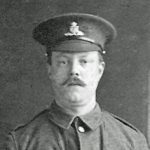 He was 34, married to a Marion (nee King), to whom he agreed to send 6 shillings of his army pay. Cadot was just over 5ft 6inches (1.68m) tall and his chest measured 37 and a half inches (90cm), with an additional 4 inches when expanded. 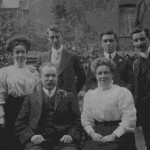 Auguste and Marion married at St Stephen’s Church, South Lambeth on 1 August 1912. 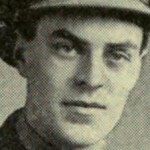 There was one child, Dennis Auguste Cadot, born 30 April 1915. The 1901 census showed that Auguste was one of three children of Laure Erzberger, a Frenchwoman. When Auguste was 20 and she was 51, she was married to Charles Erzberger, a 47-year-old German, a banker’s clerk. The family lived at 63 Gleneldon Road in Streatham. Both Auguste and his 27-year-old brother Henry Cadot were employed as manufacturer’s clerks. The household included a 15-year-old sister, Florence, born like her brothers in Kennington, and Alice Miller, 20, a general domestic servant who was born in Poulton, Gloucestershire. The 1911 census shows Auguste was living alone in one room at 261 Clapham Road. 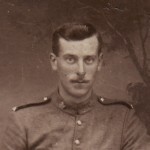 The census describes him as a “cashier, book keeper, patentee and manufacturer” but by the time Cadot enlisted in the Royal Garrison Artillery in December 1915, he was describing himself as an accountant and book-keeper. Cadot served in a Seige Battery of the Royal Garrison Artillery (these were batteries equipped with heavy howitzers, sending massive shells to neutralise the enemy artillery and destroy dumps, stores, roads and railways behind enemy lines). He was a signalman but there are two parts to the abbreviation and I cannot tell what the first part is (Senior? Leading?). In any case, the records show that he passed 1st class in telephony, that his character was “good” and that he spent time in France and in Italy. 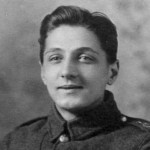 Cadot was hospitalised several times and sent home for leave, but after a 16-week stay in hospital, he was discharged on 12 February 1919, three months after the end of the war. 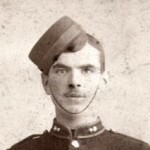 He had served his king and country for three years and 64 days and his health was ruined. His record was stamped “No longer physically fit for war service” because was suffering from chronic nephritis “caused by service”. The medical problems Cadot complained of included loss of sight (retinitis) and headaches. Nephritis, diagnosed by the doctors, is an inflammation of the kidneys. However, many soldiers suffered a specific type of the disease known as “trench nephritis” or glomerulonephritis, which was caused by living conditions in the trenches. The symptoms included breathlessness, swelling of the face or legs, headache, sore throat, and the presence of albumin and renal casts in urine. It affected 15,837 (1.8%) First World War pensioners. The doctors examining Cadot noted the loss of sight and headaches, albumin traces, high blood pressure and cardiovascular changes. Nevertheless, when assessing Cadot for pension one doctor judged that “he will get work”, he was 80% disabled and that his symptoms were likely to last one year. Alas, this prediction proved to be true, as Cadot died in Lambeth just under a year later, on 25 January 1920. He was 39. 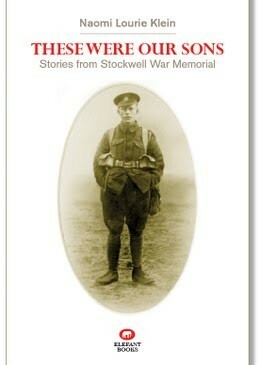 The mystery of his absence from the standard databases of the First World War is solved. He died of the war, but too late to be included. Not too late to be memorialised in Stockwell, which he had called home and where he had started to raise a family.